Ultrasound should have been huge. Fronted by Andrew 'Tiny' Woods, they were an explosive art rock indie five-piece from the North of England who dared to combine glam, prog and punk and audaciously released a double album as their debut in 1999 before imploding at the turn of the millennium. 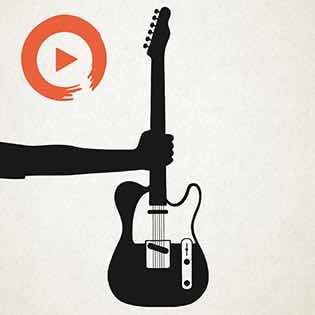 Then, 12 years later, they surprised everyone by reforming and recording a second album, Play for Today, which opens with this "clarion call" for the rights of the poor. Welfare State is a song of us and them. Ultrasound do not want to be a part of your Britain if you have never known what it is like to go without, if you believe that refugees are benefit scroungers, if you think that unemployed people are too lazy to work and you were brought up to think some people are innately dangerous or untrustworthy because of their race or sexuality. If the choice is between prejudice and poverty, they'll take poverty every time and you can stick your privilege up your country estate. "We have no souls, we have no homes," boasts Tiny, "we are the greasy, unwashed scum, we are the paupers on the run, we've never done a day's work in our lives..."
Not enough songs are written about The Welfare State. Britain is rightly envied the world over for it. This system of health care, free education, unemployment benefits, disability benefits, state pensions and more is a gift to the people from the people, to care for each and every individual from the cradle to the grave. Established by Prime Minister Clement Attlee's Labour government immediately after the Second World War, the Welfare State was designed to wipe out five blights on post-war society: disease, want, squalor, ignorance and idleness. Liberal reformer Sir William Beveridge called them the five "giant evils". But by 2016, the National Health Service - a pillar of the welfare state - had come under threat from rising costs and insufficient staff. And thus it became a bargaining chip in the 2016 campaign to persuade the British public to leave the European Union. It's a pretty good rule of thumb that any movie advertised on the side of a bus will turn out to be irredeemably awful. If you're booking your ticket based on a bus ad, you can expect your evening to be less 12 Years a Slave and more Alvin & the Chipmunks 3. And so no one should have been surprised when a key slogan of the Brexit leave campaign, emblazoned on the side of a big red bus in May 2016, was a tawdry lie. 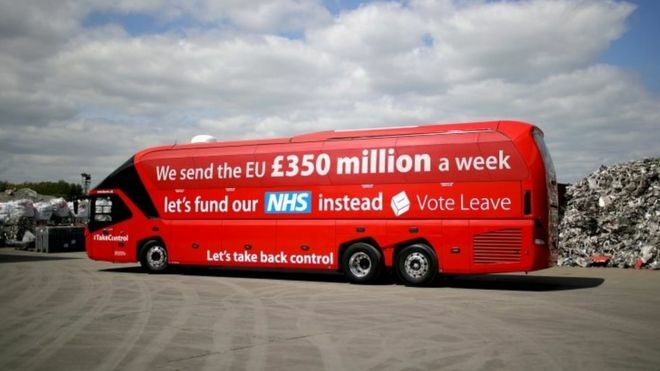 "We send the EU £350 million a week," claimed the side of the Brexiteers' battle bus. "Let's fund the NHS instead. Let's take back control". A compelling notion, if you put your trust in an editorial written in foot-high letters with professional buffoon Boris Johnson standing in front of them. Of course, it pretty soon became apparent that this £350 million figure had been plucked out of thin air by a Tory Eurosceptic backroom boy called Dominic Cummings, Director of the Vote Leave campaign. Naturally, membership of the EU does come at a cost, but after various rebates it amounts to a lot less than £350 million a week and that figure does not take into account the numerous benefits of membership, specifically freedom of movement and trade within the member states, subsidies for farming, a set of legal rights agreed by all the members and the collective power of the entire union in economic and political negotiations with the rest of the globe. Not to mention the free hospital health care all British citizens are guaranteed while travelling to an EU member state. The lie may have been exposed, but the damage was done and in June 2016, by a narrow margin, British people voted to give up those membership benefits. Leavers expressed many reasons for their decisions, but doubtless some of those voters believed they were heroically helping to save the NHS, the jewel in the crown of the Welfare State. "We are the ones, the sons of mums, who worked their fingers in half, so everybody could starve, to make this possible, 'cause no one ever cared about us, And this song is the clarion call, and if it means we have to reform, we crashed and burned but we returned, to claim our stake from the day that we're born to the day that we die, we are safe in the arms of the Welfare State". The Fever 333's Made an America owes a mighty debt to epoch-making Nineties LA alternative rock act Rage Against the Machine, delivering music with a purpose, bringing the vicious vitality of Killing in the Name up to date for the Trump era with a song that reminds all Americans that their nation was founded on the backs of black slaves. A downbeat, trip hop giant, pregnant with heart-bursting emotion, Charlottesville is simultaneously a tribute to those who risk their lives to stand up against race hatred and a declaration of rage against right-wing extremists - especially those in the highest office. The pernicious effect of keeping silent when you ought to be screaming and sobbing is explored in Samaritans, the latest track from IDLES, from forthcoming album Joy as an Act of Resistance. But this article isn't exactly about IDLES, the intense alternative five-piece from South-West England. Instead, it’s about a group of their fans who, in the last year, have changed each other's lives and restored their faith in humanity. And if their motto, "All is Love", means something to you, they would like you to join them.